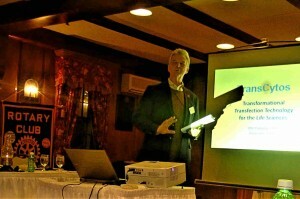 Rotarian Otto Prohaska shared his life’s work with us on Monday night. We sat at attention like we used to in school as we learned about the anatomy of a cell. 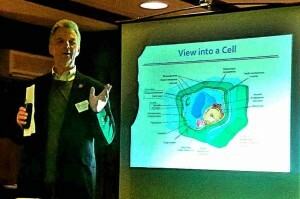 Otto has been doing some exciting work on cell research that he hopes will someday lead to very targeted cures for many diseases including cancer. Impressive work! The Winner Claims Her Prize! 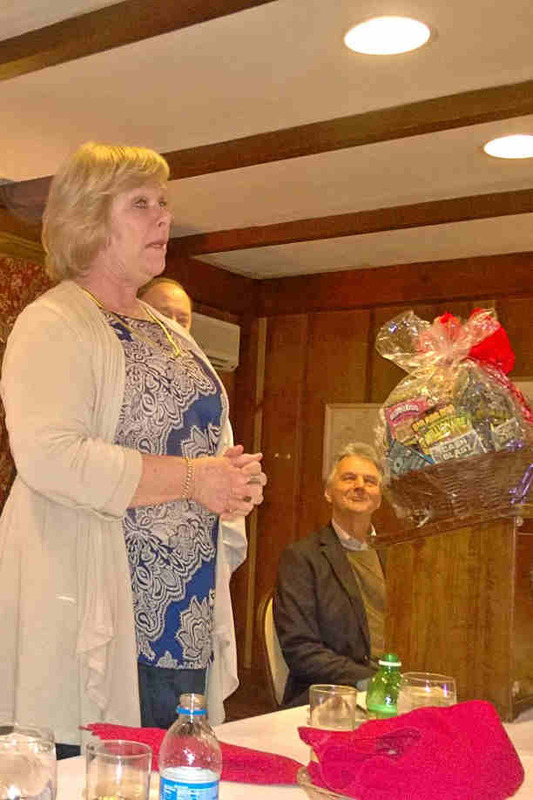 The winner of the basket of lottery tickets drove from North Dighton MA with her husband to attend the Sturbridge Rotary meeting on Monday night and to claim her prize. She is still so excited about winning this prize and hopes that this is a sign that her luck is changing. She attends the Sturbridge Harvest Festival in October every year and bought her ticket from us at that time. Congratulations Doris! 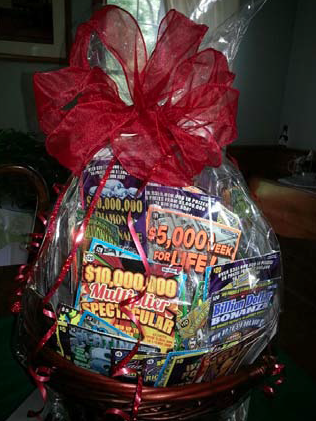 We hope you scratch many tickets that are big winners! She promises to let us know how much she wins! Lucky Lady! 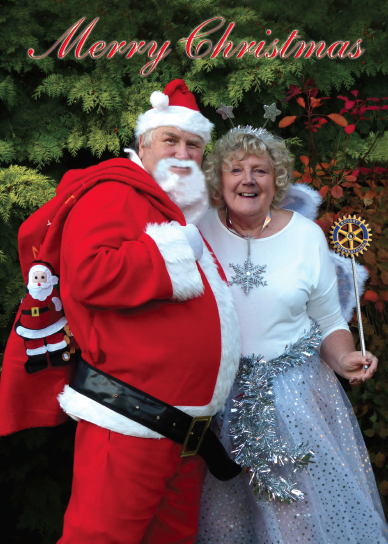 Our Stourbridge UK Sister Rotary Club created a Christmas Card this year; one that should be of interest to us in the Sturbridge Club. You may not know this Santa yet, but you surely will by this time next year. 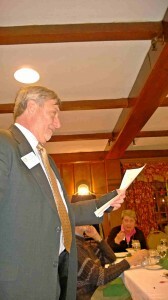 Santa Arthur Baker will be the President of the Stourbridge Rotary Club when they visit us in the USA next Fall. Naturally he will be accompanied by his wife, Maureen, and other Stourbridge Club members with their spouses. Their visit will be fun. The picture tells all! Rotarian Carl Kaliszewski gave us a brief update on the Rotary Foundation and shared the following statistics with us: Of the 53 clubs in our district, 24 of the clubs have Major Donors “MD” ($10K and above). One club has 9 MDs, and 9 Clubs have only one MD. Of all the clubs in our district, there are 63 members well on their way to being MDs. The Sturbridge Club has one member who is almost at that level. Carl went on to remind us that we need to raise the average donation by each member to $150 dollars in order to reach our level of qualification to be matched for our fundraising. The name of the winner of the basket with $1,000 worth of lottery tickets was pulled at our meeting on December 8th from a large container of ticket stubs. Yes, we sold every single ticket that was printed! The winning ticket was #730 purchased by a lucky lady from North Dighton, MA. According to the code on the ticket, it was sold at the Sturbridge Harvest Festival in October. President Larry immediately called the phone number on the ticket stub to give the winner the good news. She was amazed because she said, “I never win anything!” Unfortunately she is not able to attend one of our meetings to claim her prize so we will be getting the tickets to her and wish her the best of luck as she spends time scratching all those tickets. She promises to let us know how much she wins. Our sincere thanks go to everyone who bought a ticket for this fundraiser. The proceeds from this event support the scholarships we award to Tantasqua seniors who are pursuing a college degree. Thanks also to Rotarian Peter Zeh for organizing this annual fundraiser and to all the Sturbridge Rotarians who spent time working several shifts during the last few months to sell all 1,000 tickets! Lottery basket waiting for the winner to be chosen. President Larry pulling the winning ticket stub. 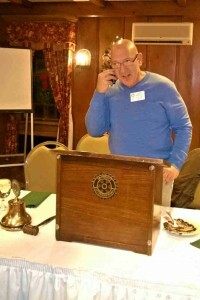 President Larry calling the lucky winner. The Sturbridge Rotary Club has been raising funds by raffling a Basket containing $1,000 worth of Lottery Tickets. The proceeds go directly to scholarships the club awards to graduating high school students. The Letters of Thanks we receive from those students show us just how much this help is appreciated by them. 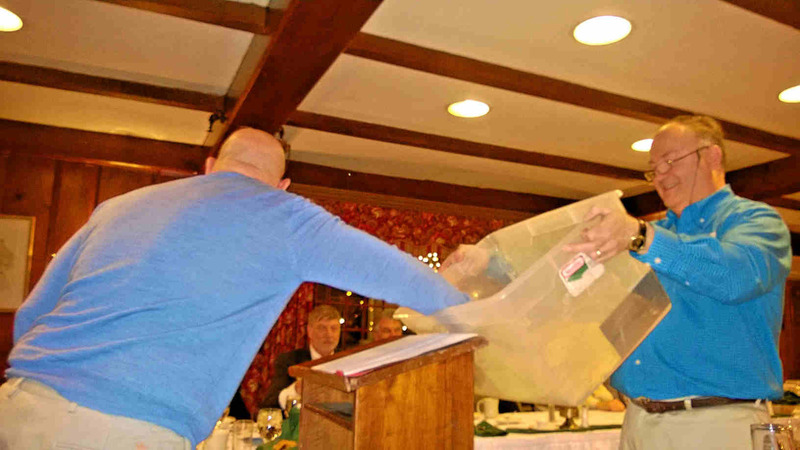 The lucky ticket was drawn last Monday, December 8th, at the Sturbridge Rotary Club meeting. 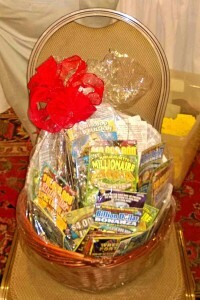 The Winning Ticket was #730, bought by a lady living in Dighton, MA. The Sturbridge Rotary Club members heartily thank everyone who bought a ticket and wish you all a Wonderful Holiday Season & Happy, Healthy New Year. The Thanksgiving Day Football game is over and in spite of the challenges playing on a snow-covered field, the Shepherd Hill Rams won the game with a score of 22 to 6. This is the third year the Rams have won the Sturbridge Rotary Homecoming Football Trophy. They returned to Rotary this week to claim the trophy for another year. 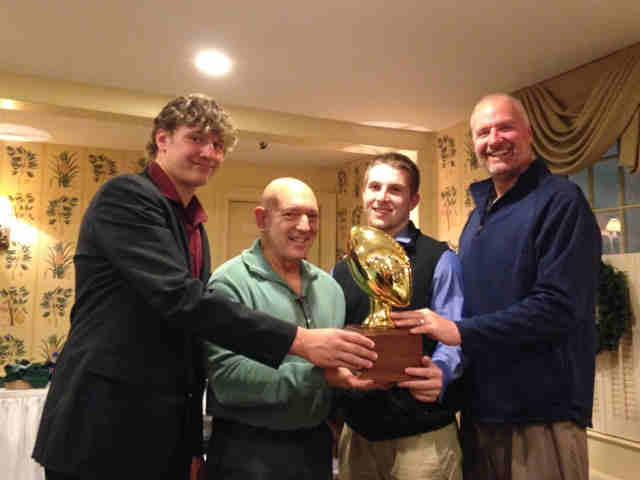 Shown (left to right) are Chris Lindstrom, President Larry Mandell presenting the trophy, Brady Ravenelle and Coach Lindstrom.